What went on in the EU Brussels Institutions on Wednesday? 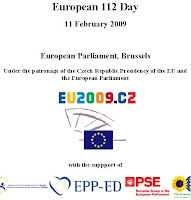 Only a large scale demonstration attempting to promote the EU emergency number 112. Surprise surprise, the EU would like to replace our well-known emergency number 999 to its preferred 112. What a ridiculous idea - totally out of touch with what is going on in the World today. Not only is it pointless and unneccesary, it proves the point that the EU is not a beneficial organisation. Merely a gravy train for beaurocrats. While we are suffering an economic crisis closely turning into a disaster reminiscent of 1929, the EU would like to promote a new emergency number!!!!! Presposterous. While our Government is largely impotent in its ability to help solve the economic situation, thanks to EU regulations, the EU itself isn't even bothering help out at all. Really, it is time to say enough is enough! Fed up of the EU and its pointless wastefulness? Phone 112, Ooops sorry, call 999 and inform everyone of the emergency that needs addressing, Britain's withdrawal from the European Union! Vote UKIP on 4th June 2009 and help get back control of our Country.